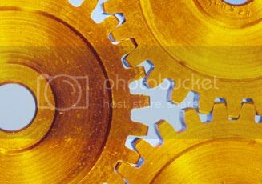 Non-recurring manufacturing and selling situation are constantly faced by controllers [and accountants] when analyzing the manufacturing and selling functions which is a strategic matter of choosing alternative quick courses of action. Typical questions include: What to make? How to make it? Where to sell the product or service? What price should be charged? In the short run, the controller [accountant] is typically confronted with the following non-recurring, non-routine types of decisions: acceptance or rejection of a special order, make or buy, add or drop a certain product line, utilization of scarce resources, sell or process further. Through this post, I reveal those insight analyses with some easy case examples. Enjoy! In each of the above situations, the ultimate decision rests upon cost data analysis. Cost data are important in many decisions, since they are the basis for profit calculations. However, not all costs are of equal importance in decision making, and accountants must identify the costs that are relevant to a decision. Such costs are called “relevant costs”. Which Costs Are Relevant In A Non-recurring Decision? The relevant costs are the expected future costs which differ between the decision alternatives. The sunk costs are not relevant to the decision at hand, because they are past, historical costs. The incremental or differential costs are relevant since they are the ones that differ between the alternatives. Example: In a decision on whether to sell an existing business for a new one, the cost to be paid for the new venture is relevant. However, the initial cost of the old business is not relevant to the decision because it is a sunk cost. Assume that Lie Dharma Putra Company is planning to expand its productive capacity. The plans consist of purchasing a new machine for $50,000 and disposing of the old machine without receiving anything. The new machine has a five-year life. The old machine has a five-year remaining life and a book value of $12,500. The new machine will reduce variable operating costs from $35,000 per year to $20,000 per year. When Should A Company Accept Special Orders? A company often receives a short-term, special order for its products at lower prices than usual. In normal times, the company may refuse such an order since it will not yield a satisfactory profit. The company has just received an order that calls for 10,000 units @ $1.20, for a total of $12,000. The acceptance of this special order will not affect regular sales. Management is reluctant to accept this order because the $1.20 price is below the $1.50 factory unit cost ($1.50 = $1.00 + $0.50). Is filling the order advisable? The answer to this question is yes. The company can add to total profits by accepting this special order even though the price offered is below the unit factory cost. At a price of $1.20, the order will contribute $0.20 (CM per unit = $1.20 – $1.00 = $0.20) toward fixed cost, and profit will increase by $2,000 (10,000 units × $0.20). Using the contribution approach to pricing, the variable cost of $1.00 will be a better guide than the full unit cost of $1.50. The fixed costs will not increase because of the presence of idle capacity. The supplier has offered to provide the subassembly at a price of $16 each. Two-thirds of fixed factory overhead, which represents executive salaries, rent, depreciation, and taxes, continue regardless of the decision. Should the company buy or make the product? In this example, direct fixed costs are those costs that are identified directly with each of the product lines. Allocated fixed costs are the amount of common fixed costs allocated to the product lines using some base such as space occupied. The amount of common fixed costs typically continues regardless of the decision and thus cannot be saved by dropping the product line to which it is distributed. 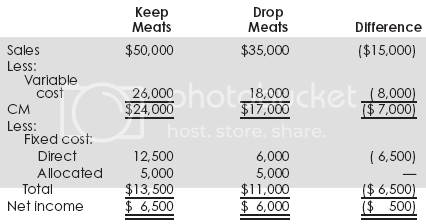 From either of the two methods, we see that by dropping meats the store will lose an additional $500. Therefore, the meat product line should be kept. One of the great dangers in allocating common fixed costs is that such allocations can make a product line look less profitable than it really is. Because of such an allocation, the meat line showed a loss of $1,000. In effect it contributes $500 ($7,000 – $6,500) to the recovery of the store’s common fixed costs. In general, the emphasis on products with higher contribution margin maximizes a firm’s total net income, even though total sales may decrease. This is not true, however, where there are constraining factors and scarce resources. The constraining factor is the factor that restricts or limits the production or sale of a given product. Examples: machine hours, labor hours, or cubic feet of warehouse space. In the presence of these constraining factors, maximizing total profits depends on getting the highest contribution margin per unit of the factor (rather than the highest contribution margin per unit of product output). 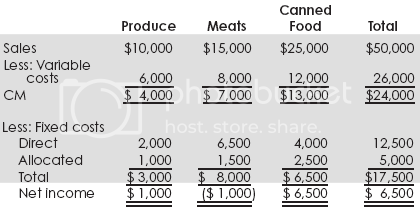 Assume that a company produces products A and B with the following contribution margins per unit. As is indicated by CM per unit, B is more profitable than A since it contributes more to the company’s total profits than A ($4 vs. $2). But assume that the firm has limited capacity of 10,000 labor hours. Further, assume that A requires two labor hours to produce and B requires five labor hours. One way to express this limited capacity is to determine the contribution margin per labor hour. Since A returns the higher CM per labor hour, it should be produced and B should be dropped. The presence of only one limited resource is unrealistic. Virtually all firms encounter multiple constraints: restrictions on materials, labor inputs, demand for each product, warehouse space, display space, and so on. The solution of the product mix problem with multiple constraints is considerably more complex and requires a technique known as “linear programming”. Related Topics:Make-Or-Buy DecisionMaking the Best Use of Scarce ResourcesManufacturing and Selling AnalysesNon-recurring Manufacturing AnalysisNon-recurring Manufacturing and Selling AnalysesNon-recurring Selling AnalysesThe Incremental AnalysisTo Add or Drop a Product LineWhat Are Relevant Costs?When Should A Company Accept Special Orders?Which Costs Are Relevant In A Non-recurring Decision?